Amateur vs. professional boxing - a mismatch or a unity? Amateur vs. professional boxing – a mismatch or a unity? 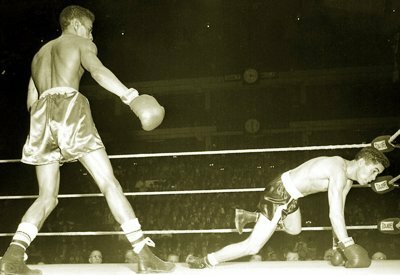 Now that amateur boxing is on the brink of extinction (check out “The Prince and the Pauper” article), we might take a look back at it before amateur boxers turn into free lance Olympic semi-professionals. Amateur and professional styles have their specific flavors but it is still boxing and the two styles (in fact there are many) may not be as different as they seem to the naked eye. The amateur code provides a platform where a boxer has to fight whoever comes his way with no choice or advance knowledge of his opponents. As long as he is winning he advances forward and can be a champion. No negotiations and hype are necessary to set up a championship fight. That means no promoters either, only one sanctioning body which acts as a promoter for all national federations. Politics and the suspect computer scoring system have been a problem but basically it’s very difficult to keep a good man down in the amateur circuit. The best have to fight the best all the time and there are no prima donnas who can come up with excuses for avoiding a strong opponent. Rocky Marciano and Floyd Mayweather lost several times as amateurs. Fighting for 3 rounds is easier than fighting for 12 rounds but the pace and the tempo of an amateur bout are turbulent and there is little room for error. You have 9 minutes to show what you are made of and you have to pack all your skills and wits into that time frame. A pro bout is like boxing in slow motion in comparison to an amateur fight. Then there are the amateur big gloves and the head guards that are meant as safety measures. The big gloves are not better for defense as they block your vision more; they are not softer at the knuckle area. They are heavier and would muffle a light punch but would not necessarily slow down a big shot. It’s like choosing between a big baseball bat and a small bat, which one hurts more? Both hurt, if you have to swing 10 times, you’d better take the bigger one, for 50 swings you are better off with a lighter one. A big puncher would punch harder with the heavier gloves before he gets tired. They are not that heavy to slow you down from the start. Small gloves would favor a puncher in the second half of a pro fight when the bigger gloves would indeed be a burden. The head gear is another good intention gone sour. It protects you from cuts and bruises to some extent but actually adds to the concussive effect of big shots. It also makes the head bigger and caches some additional glancing shots. It is a target in itself and you have to slightly exaggerate the defensive moves to make sure you are in the clear. Precious points are conceded when the gear almost comes off from shots that otherwise would have whistled past your ear giving you a countering window. The head gear also hides the face of the boxer and often fans have to rely on the color of the outfit for recognition. It would be unthinkable for a prize fighter to come out with a vest and a helmet as if he has something to hide, he would be booed. The computerized scoring system of the amateurs almost stifled the classic amateur style. It favored singled long range scoring shots and turned boxers into fencers. Fencing with gloves – that is going from deep defense into a fast long range attack and then run- was preferred by judges over solid counters and head-body-head openers followed by a pivot with a hook- uppercut combo and take that one-two as you go. Scoring flurries were often ignored in favor of a straight right on the side of helmet. Some nations were arrogantly favored while others were mercilessly short-ended. Now the computerized scoring system, the head gear and even the designation “amateur” are being phased out and replaced by a new world order. The borderline between amateur and pro will become a grey area. Time will tell if this will work. In any case, boxing is boxing no matter what you call it and the basics of boxing are the same for everyone. Promoters can still steal amateurs for the price of a signing bonus and get a fighting machine with years of experience leaving amateur coaches and federations in the cold. The problem is after minor adjustments these amateurs like Guilermo Rigondeax and Vasyl Lomachenko will start beating your big stars in no time and investments will be jeopardized. Andre Ward, Gennady Golovkin and Sergey Kovalev are wreaking havoc in the pro ranks; Klitschko and Mayweather are not shaming their pedigree either. Even the runners-up like Gamboa, Povetkin, Pulev, Wilder, Provodnikov, etc. are leaving little room for pure pros. You are here: Home / Boxing News / Amateur vs. professional boxing – a mismatch or a unity?